An estimated 47,700 home structure fires in the United States every year, all due to some form or electrical failure or malfunction. It’s imperative for every property owner to take the precautions necessary to prevent needless damage and injury resulting from such disasters. Never remove the grounding pin (the third plug) to make a plug fit into a two-prong outlet. Don’t nail or staple electrical cords to walls, floors, or other objects. Extension cords are designed for temporary use; don’t utilize them as permanent household wiring. Replace missing or broken wall plates so that wiring and components never remain exposed. If an appliance is repeatedly blowing a fuse or trips a circuit breaker, unplug it and have an electrician check out the problem. Outlets in the kitchen, bathroom, workshop and laundry rooms should always be equipped with ground fault circuit interrupters, and these need to be tested on a regular basis. Check electrical cords regularly to make sure they haven’t become frayed or cracked. Also, they should not be placed under carpeting or rugs. And when working outdoors, take care to keep yourself and all equipment a safe distance—at least ten feet—from power lines and service connections. Check for power lines before setting up ladders or using long tools. Additionally, never use electric tools in the rain or if the ground is wet. For additional information on preventing electrical hazards, visit SafeElectricity.org. Your local Handyman Matters office can send out a craftsman to do an assessment around your home to determine if there are any potential electrical hazards that need addressing, and they can assist you with making any necessary corrections. Call 1(800)FIX-MY-HOME or enter your zip code on our website to locate the office nearest you. Kitchen Remodel – Go Big or Go Small? The National Kitchen and Bath Association tells us that the average kitchen remodel comes in at about $57,000. That’s a lot of money, no matter how you look at it. Here are two things to consider: (1) How do you make sure you’ll get the most out of an expensive redo, and (2) What are some ways to give your kitchen a face-lift without spending a fortune? Any big kitchen remodel should stand the test of time. Avoid fads. 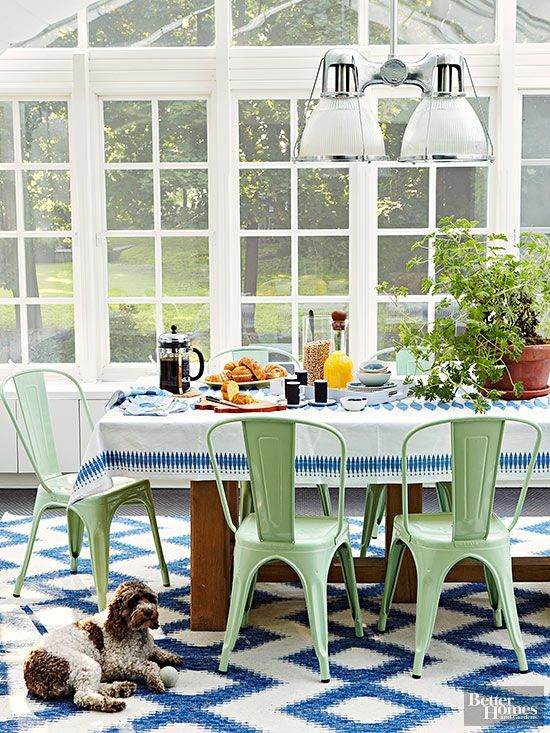 Certain fixtures and colors are popular in the short-term, but they’re this year’s trend, and may be out of fashion in a matter of several months. Design experts agree that white is the one color that endures, because it creates an open and airy environment and because it pairs well with everything. It regularly tops the list of most popular kitchen colors. White appliances, in fact, outsell all others. It’s a standard color for manufacturers of all products, making it easy—and affordable—to find things like cupboards, counters, and tile to match the room’s decor. When you consider a remodel, whether to sell your home is probably the last thing on your mind, but nevertheless, every redo should be undertaken with an eye towards just how long you plan to remain in your home. Because white remains popular as a decorative element, it has inherent marketability, and will give your house added appeal at re-sale, when you do decide to sell your home. Are you contemplating giving your kitchen a face-lift, but don’t have the budget for a complete remodel? There are a number of economical “tricks” you can employ to give the appearance that you’ve completed a much bigger redo than you actually did. Change out your cabinets or just the cabinet doors. Add crown molding or decorative trim along the walls. Installing new light fixtures or task lighting is a great way to give your room an updated appearance while remaining within a budget. Replace old hardware with a new sink or fixtures, drawer handles or pulls. How about new window treatments? 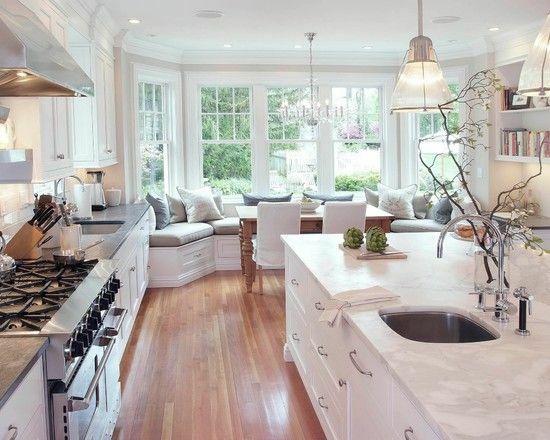 And quartz-type counter tops or ones made from white concrete are distinctive, versatile and eye-catching. Other, more cost-effective options, include sanding and re-staining cabinets, adding new tile back-splashes or applying a simple coat of paint to the walls. Any of these choices will give your kitchen a distinctive new look. Need help with your redo, either large or small? Call 1(866)FIX-MY-HOME or enter your zip code at www.handymanmatters.com to find the office nearest you. No space for a full dining room in your kitchen? Or, is there a small corner with a lot of light? Breakfast is what starts your day. Get a positive start by having a cozy spot to enjoy coffee and the paper with your favorite loved ones. A casual and affordable addition to your home, and you can even build one DIY! Natural light, especially in your dining room, is a housing luxury. 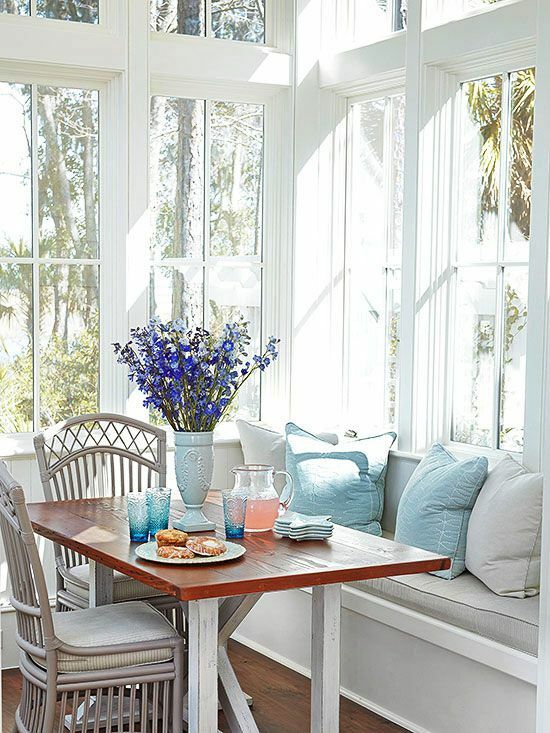 Take advantage of the long summer days by allowing in as much daylight as possible. Removing your window coverings will instantly light up any room. You can never have enough counter space in the kitchen. Islands in the kitchen provide extra space and also extra storage. Create one on a budget by modifying a small table. A bright coat of paint, and added hangers are the perfect additions. It’s easy to lose things like measuring cups and other smaller utensils in drawers. 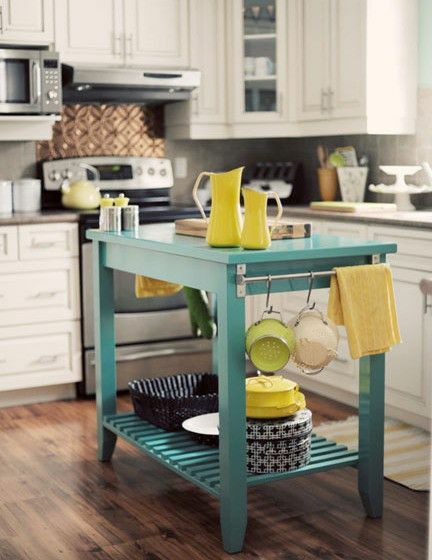 Modify your cabinets to have easy-access hanging areas for your regularly used cooking materials. 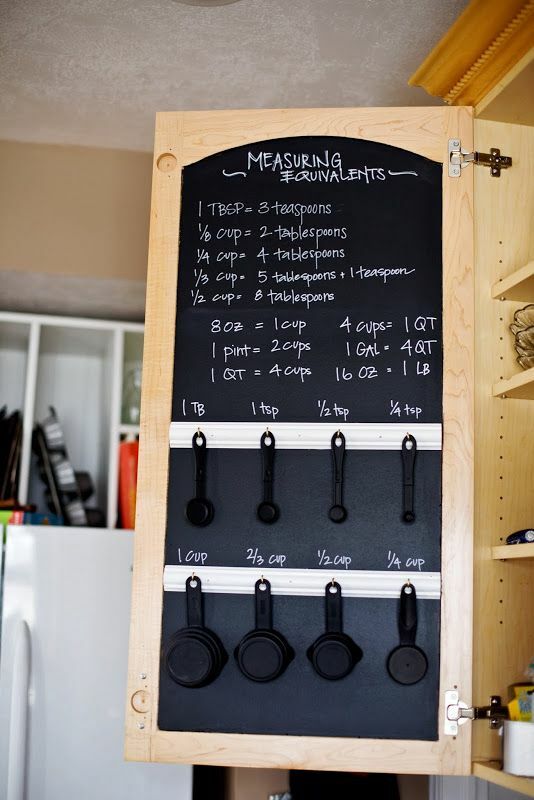 A coat of chalkboard paint on the interior is also a fun way to keep track of measurement conversions, grocery lists, or cooking notes. Nothing can instantly face-lift a room quite like adding new lighting fixtures. Adding a sleek, mid century inspired light, in a contrasting color to the rest of your kitchen will create a great point of interest. Not all kitchen remodels need to be expensive, or even a full overhaul. 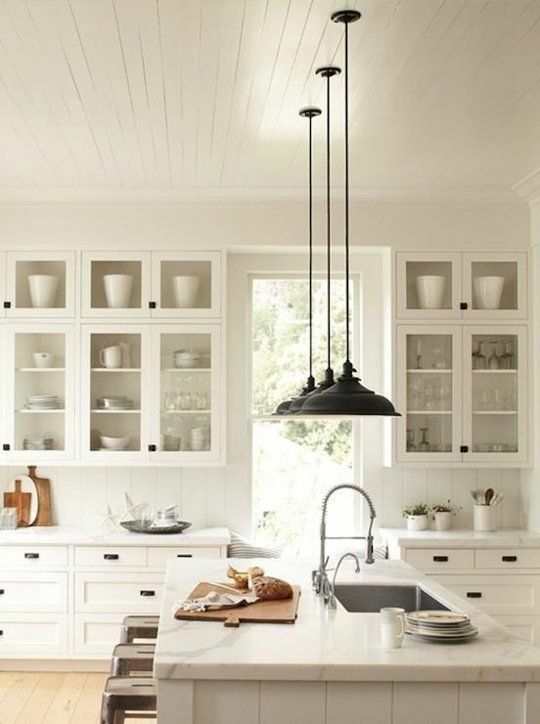 Adjusting the details of your kitchen can do a lot to bring your space into this century. For assistance in your next home improvement project – give Handyman Matters a call 866-FIX-MY-HOME! Homeowners often look at their basements as the ideal spot for adding for living space to their house. It makes sense—the space is already there, probably used for little more besides laundry facilities and storage. Converting it to something else is likely to be less expensive or disruptive than adding on a space somewhere else in the home. But there can be pitfalls, as well, and it’s important to do some due diligence before you make extensive plans or spend a lot of money. Typically, utilities are already in place (water, gas, electricity, sewer lines) in a basement, which can be a great cost savings. Heating and cooling costs are generally less for basement areas, as well. However, these advantages need to be weighed against the possible pitfalls of opening up this space for additional use. Do ductwork and/or overhead pipes need to be concealed? How much natural light filters through the windows? How much additional lighting may be required to create a warm and comfortable space? How much ventilation is available, and have there ever been any indications of mold, mildew or leaks? Below-grade spaces are subject to water and moisture. Water can build up between the slab and foundation wall. If so, this may be an easy fix, provided its source is something like defective gutters and downspouts. If the issue is more involved than this, the solution will be, as well. In any event, a basement remodel should utilize water-resistant materials such as mold-proof PVC moldings, compressed fiberglass wall panels, and moisture-proof drop ceilings. Lighting can be upgraded with fluorescent overhead fixtures or perimeter lighting like sconces or recessed spotlights. And don’t overlook safety concerns: Smoke and carbon monoxide detectors are a must, as are extinguishers and fire-resistant materials. Even with stairs leading to the upper level, easy egress through windows is a not just a precaution, but is dictated by safety codes. Re-making your basement space into something more inviting and user-friendly can be a rewarding experience, so long as you proceed with caution and with all the available information at your fingertips. Consult with a licensed, reputable contractor, and be aware that you cannot convert a basement without you or the contractor obtaining permits. For consultation and assistance with a basement remodel, talk to your local Handyman Matters office. They can be reached by calling 1(866)FIX-MY-HOME. A recent trend in home remodels has been the choice to convert a room into an entertainment space. Whether it’s the departure of the last child for college or the realization that a certain area of living space has been underutilized for years, more homeowners are indicating a preference for a place they can relax, host guests, play games, or pursue physical fitness. In many instances, it’s relatively easy to re-purpose a sewing room, den or spare bedroom, depending upon the sort of conversion you have in mind. New flooring, fresh wall paint and the elimination of some furnishing and decoration may be all that’s required to effect the transformation. Relocate the television or spring for a larger one (or for an entire entertainment center), and you’ve created a home theater. Maybe you want a more interactive space—an area in which you can play card or board games, a studio to record music or podcasts (if that’s the case, you might want to get a new USB microphone and microphone desk stand), assemble jigsaw puzzles, or do crafts projects. Or you might desire a room that can accommodate a ping-pong or pool table. These are additions that require more thoughtful planning, since they demand more space and more specific lighting concerns. The same holds true if you’d like the room to include a wet bar, or workout equipment. A bar and ice-maker require access to water pipes, and heavy gym equipment may demand additional floor support. Basements are well-suited to both these needs, and are removed enough that noise and activity are less likely to be a distraction to the rest of the house. At the same time, they may require more effort, time and expense to transform them into something brighter and more welcoming. In any event, you will achieve your best-desired results by considering how you are most likely to spend your “down” time. As with diets and New Year’s resolutions, your tendency will be to “dream big,” rather than realistically. Your aspirations may not match exactly the outcome, leaving you with gymnasium equipment going untested or an expensive billiard table that gathers cobwebs after just one or two outings. It’s far better to begin by asking yourself, “What do I like to do to relax in my own home?” rather than “What do I think might be fun to try?” If you’ve had a gym membership, for example, and made good use of it, then a home workout center is a viable option. If your thought is, “I might work out more, if it was just easier,” then you may be overreaching. Similarly, if you don’t have guests over regularly but think you might if you just had a more inviting space, you may be headed down the wrong path. Start hosting company first, and if you find the only thing hampering your efforts is limited space, then a designated new entertainment space will probably see a lot of use. But if you find it exhausting or otherwise unrewarding, then a sparkling new area dedicated to being sociable is unlikely to change your outlook. Consider an entertainment room as an extension of the interests you have already, and you are much less likely to be spending money on a remodel that will likely go underused and unappreciated. For guidance in all home improvement and home remodel projects, remember that you can always call 1(866)FIX-MY-HOME or enter your zip code at handymanmatters.com to find the Handyman Matters office nearest you, where qualified craftsmen stand ready to answer your questions and assist with any repair or improvement project you may be considering. A focal point of any bathroom is the tub or shower, so when planning a bathroom remodel, it’s important to take into consideration how you may want to “change up” a shower door to its best effect. Shower doors primarily fall into two types: Bypass doors and pivot doors. Bypass are also known as sliding doors, and consist of 2 or 3 panels that slide past each other on tracks situated at the bottom and top of a shower unit. They take up less space, which is why they tend to be the most popular. Bypass doors are also more of a challenge to clean and to keep clean, as the tracks tend to collect water, soap and other debris, creating an environment where mold and mildew can grow, so they require more frequent maintenance. If you’ve had this type of arrangement in your bathroom for a while, it might be time to consider making a switch. Pivot doors—also called hinged or swinging doors—generally take up more space and therefore are generally utilized in larger bathrooms. It is possible, however, to mount them so that they open inward, although this is often less practical. A less commonly seen shower door is the rounded type. This is curved glass, operating on a hinge, just as pivot doors do. These work well fitted into corner spaces in smaller enclosures. Most shower doors are framed, the glass surrounded by an aluminum or composite casing, and these latch into a track. The more modern trend is toward frameless doors which require less upkeep and fit well into contemporary bathroom design. Clear glass is most popular. It allows light to penetrate and lessens any sense of feeling confined in a too-small space. Frosted glass provides a stronger sense of privacy and is available in different colors, designs and patterns. Rain glass is textured on just one side, smooth on the other, and offers the same features as frosted glass. Tinted glass provides a sense of privacy and comes in such a wide variety of colors that it’s easy to choose one that will complement the décor of the rest of the bathroom. Do I Need A Shower Door? Some modern bathroom designs eliminate the need for a shower door altogether. There are many wraparound shower ideas that incorporate block glass and stone or tiled walls separating the enclosure from the rest of the room. These lend the bathroom a more open or expansive feel, and they are easier to enter and exit than through a standard shower door. Ultimately, the ideal shower set-up for your home is the one that finds an ideal compromise between function and your personal taste—what looks good and feels right for your bathroom? Consult with your local Handyman Matters office where their craftsmen are happy to listen to your ideas and share their expertise. Call 1(800)FIX-MY-HOME or enter your zip code at handymanmatters.com to schedule a service call or to get more information about our services. Unless you have an unlimited supply of cash, or you figure you won’t be staying in your current home much past retirement, you will want to approach a bathroom remodel or upgrade with an eye towards what is both attractive now and functional as you grow older. The image of an accessible bathroom as something clinical- or sterile-looking is outdated. It’s not only possible to have an appealing and charming powder room that incorporates accessibility features, it’s become easier than ever, thanks largely to the aging Baby Boomer population that has begun requesting such things. Grab bars, head rests and other assistive technology are far less blatant and cold in appearance than they once were. And if homeowners aren’t ready to incorporate all of these elements into a current bathroom scheme, remodels can still be designed to add these elements with a minimum of fuss and disruption later. Walk-in tubs and showers have crossed over from being viewed as “old people’s” things to being trendy and convenient for everyone. And the technology of lighting design has advanced to such an extent that bathroom illumination can be flexible, so as to allow for adjustment from recessed to bold and all degrees between, depending on individual need at the time. There’s a potential financial bonus to bathroom design, as well. Bathroom upgrades ensure greater resale value. And if a member of your household has any type of physical challenge, and if the remodel is focused on making the space compliant with ADA (Americans with Disabilities Act) regulations, there is a possibility that Medicare of Medicaid will cover some of the cost if the remodel includes things like environment accessibility adaptions or assistive technology. Don’t assume these are covered, however, without checking with your doctor or local Medicare policies. Don’t reject the idea of accessible bathroom design out of hand without first exploring the new technologies and products available to add both style and increased quality of life to one of the most important rooms in your home. For additional advice or assistance in any of your home upgrade or repair projects, call 1(800)FIX-MY-HOME or go to www.handymanmatters.com to enter your zip code and find the Handyman Matters office nearest you. The average cost to remodel a basement now comes in at around $17,000. That means you’ll want to take your time and consider all of your options carefully before undertaking a project of this size and scope. You will want to ask, and answer, a handful of questions before you start remodeling. Are you wanting to add a rec room? Will the kids be spending more time downstairs? Adults? Both? Is the intent to have more space to entertain guests? Your answers to these questions will inform the types of changes you want to make. Basements are by their very nature, dark and cold places, so the challenge in most remodels is to make your space seem warm, open and inviting. You can go “cozy” by utilizing dark wood in paneling and furniture and by incorporating recessed or subtle lighting, an arrangement that works well if you desire an area for entertaining a few friends or watching movies on a big screen television. You may want to go in the opposite direction, opting for bright colors, direct lighting and a minimal approach to furnishings if you anticipate the primary function of the room to be for hosting larger get-togethers or creating a kid-friendly zone. In recent years, there’s been a marked trend towards consolidated families, with aging parents moving into their adult children’s home, but with all parties wanting to maintain distinctly separate living spaces. Basements can serve this need admirably. In most instances, it’s relatively easy to install a modest kitchen at one end of a designated living area, with a bedroom and bathroom at the opposite end. Does your basement have its own entrance? Would you like to have one? Does the remodeling plan need to incorporate laundry or storage facilities? Is it possible to include a fireplace in the re-do? Is additional insulation necessary to make year-round occupancy comfortable? Is your current power source (electrical, gas, solar) sufficient to handle the new use of the space, or is an upgrade necessary? None of these questions are designed to discourage or intimidate would-be remodelers, only to inform. Once you have a clear idea of the scope of the changes you’d like to make, and how you would like to use your finished space, it’s much easier to proceed. You’ll have a much more specific idea of the budget required and the length of time the remodel is going to take. Be sure to take a look at our post on the hidden costs of basement remodels to make sure you consider everything. A basement remodel can be a big job, but it doesn’t have to be a difficult one. Capable and friendly craftsmen, like the ones at Handyman Matters can provide helpful information, guidance and expertise in giving your home improvement project the best possible outcome. Call 1(866)FIX-MY-HOME to speak with a Handyman Matters location near you.